Nature Spec Kid’s Chewable Lutein+Blueberry is specially formulated to protect and maintain your child’s eye health. 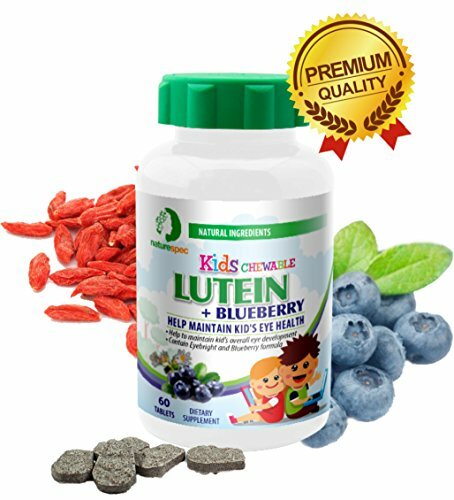 Nature Spec Kid’s Chewable Lutein+Blueberry contains Lutein, proven to support and help maintain children’s vision. With Additional nutrients including blueberry extract and natural eyebright extract, which is clinically proven to relieve eye fatigue, improve vision and filter harmful light such as blue light from the digital screens. Nature Spec Kid’s Chewable Lutein+Blueberry is infused with Taurine and Zinc to strengthen healthy retina, promote neural development and alleviate myopia. These properties form an ideal herbal remedy for your child’s eye care. Lutein, proven to support and help maintain child's vision. Additional nutrients including blueberry extract and natural eyebright extract. If you have any questions about this product by Nature Spec, contact us by completing and submitting the form below. If you are looking for a specif part number, please include it with your message.